After admiring my new cybertronic external brain-extender for a few seconds, it was time to plug it in. I reverently removed my six month old MacBook Air (half the power, half the storage, half the speed, half the RAM) from its hallowed place next to my Apple 27″ Thunderbolt monitor and went to plug in the new one: WTF? The power adapter is “new” too? Really … do you know how many MacBook Pro and MacBook Air power supplies I have scattered around? 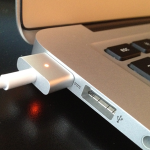 The new MacBook Air is incompatible with every Apple Power Supply ever made? No, No, No!!!!! Yes, yes, yes. What you see in the picture is a MagSafe plug on the left and the new MagSafe 2 plug on the right. I don’t think I can accurately communicate how many colorful metaphors I espoused before calling my account manager at Tekserve (My favorite place to purchase Apple products). As it turns out, there is a very ugly, non-Apple-like solution available from Apple. For $9.99 you can purchase a MagSafe to MagSafe 2 converter and stick it into your new, beautiful, extraordinary MacBook Air. Really? For $2,500 bucks? First, the sad news that you need an adaptor to use your computer with any existing MacBook power supply. Then, to add insult to injury, you have to purchase it for $9.99. Yes, this is the best 13″ computer I have ever touched. Yes, I just did a ProTools session with 10 other windows open, Adobe CS 5 running and didn’t need to use an external hard drive. Yes, this is so smoking fast, and the display is so remarkably crisp, I can’t believe that it only costs $2,500 bucks (with Apple care). But, I’m so pissed about this little $10-dollar dongle – mostly because I am sure I’m going to lose it at the most inconvenient time. Ugh! OK. I feel better now. Thanks for letting me rant like a spoiled little kid. Hey Apple, guess where I’d like you to stick this little plug?